TRUMPF software products and solutions support you perfectly in your work with sheet metal. In addition to innovative solutions in design and programming and offers for complete production control, we also offer you individual development. Highly efficient processing with modern operating concepts. TruTops Boost is our unique software for designing and programming laser, punching and bending machines that lets you increase your performance at the touch of a button. Become more profitable! Boost your business. Its new operating philosophy guides you through the software in a process-oriented manner while allowing you to keep an overview of your orders. Innovative Boost technology means fewer work steps and routine tasks – and all it takes to launch the software automation is a single click of the Boost button. Naturally you also have the option to interactively process your orders. But this decision is made by you, not the software. TruTops Boost is your all-in-one sheet metal design and programming solution. This software lets you cover more process steps and work consistently. It covers every order processing step, from 3D components to finished NC programs for bending, punching and laser programs. The result: Integrated software with connected intelligence – for the ideal interplay between software and machine. Connected intelligence: A single piece of software, a single solution, a single process: by combining several programs into one, TruTops Boost means there’s no longer any need to have different programs for different machine technologies. Shorter overall lead time: TruTops Boost saves you time by doing the programming for you. The software automatically generates your NCs, allowing you to make more effective use of your time – for instance by processing new orders. Top quality: With the reliable production process, planned programming and TRUMPF expertise this software features, you can achieve the best possible results, meet the highest quality standards – and keep your customers happy. TruTops Tube is specialized to program tube cutting machines for the processing of tubes, pipes and profiles. With the 3D tube design module included in the delivery, you can easily create complex tube designs. 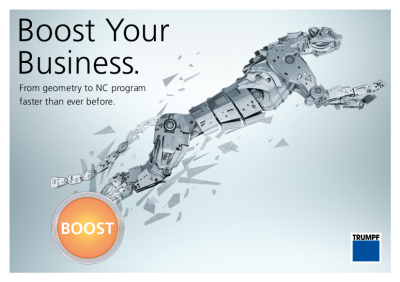 Thanks to numerous automatic processes you can create NC programs with particular efficiency. Many standard cases, such as intersections of all kinds, are already stored in TruTops Tube. This saves you costly programming time. With the programming system you also receive the most current laser tables and rules. This ensures that your machine is producing very good quality with the most efficient and reliable process flow. You can easily bring your existing CAD files into TruTops Tube via numerous standard interfaces. With the integrated 3D tube design you can also create tube designs out of several tubes. In this way you will achieve the best production reliability and precision. Because of parameterability, e.g. of length, breadth or wall thickness of the tubes, you will create different variants of the tube design as quickly as possible. The TruTops Tube programming system contains a high degree of technological knowledge. The software uses it to analyze your cutting geometries and calculates the contours. TruTops Tube performs complex tasks like the corner processing of right angle profiles automatically. The ergonomic and efficient operating design of TruTops products ensures a high degree of user-friendliness. TRUMPF offers the multitalented TruTops Cell optimized for 3-D laser processing. Laser cutting, laser welding, laser metal deposition by 3-D laser processing centers or robots – everything conveniently and reliably programmable in the office. 3-D CAD data from other CAD systems can be conveniently read by means of one of the countless standard interfaces. TruTops Cell checks the input data and corrects them automatically if necessary. You choose which data you wish to read in and you achieve the advantages of speed. You have the greatest freedom possible with regard to your own CAD data and those of your customers. With TruTops Cell you control the entire band width of sheet metal processing. Laser cutting, laser welding and laser metal deposition in 3 dimensions. For each type of processing, TRUMPF develops technical knowledge and integrates it via technology tables and rules in TruTops Cell. This lets you use the latest knowledge from the worldwide technology leader. Automatic circular interpolation, automatic transformation of standard contours into machine macros, visual track simulation and collision warning – these are only a few functions with which TruTops Cell will make your work easier. Furthermore, you choose these functions via a consistently user-friendly interface. In the background, the software ensures the greatest process reliability and production quality. The robots of the TruLaser Robot series are also easy to program. Thanks to the integrated standard optics you can immediately cut, weld or deposit. The mirroring or turning of complete programs saves valuable programming time. Program changes made at the machine can simply be read into the programming system; you can combine the convenience of programming in the office with the real production situation. Everything under control: The TRUMPF software for production control looks at the complete production process and provides the right answers to your questions. The software products support your commercial processes such as the preparation of quotations, invoicing, solutions for production planning of your orders and for monitoring and controlling your machines and automated systems. Features for material logistics round off the portfolio. You can thus do without ERP/PPC systems or can ideally supplement them. With the TRUMPF software for production control, you steer your entire workflow! With its modular design, the system can be easily adapted to your requirements. 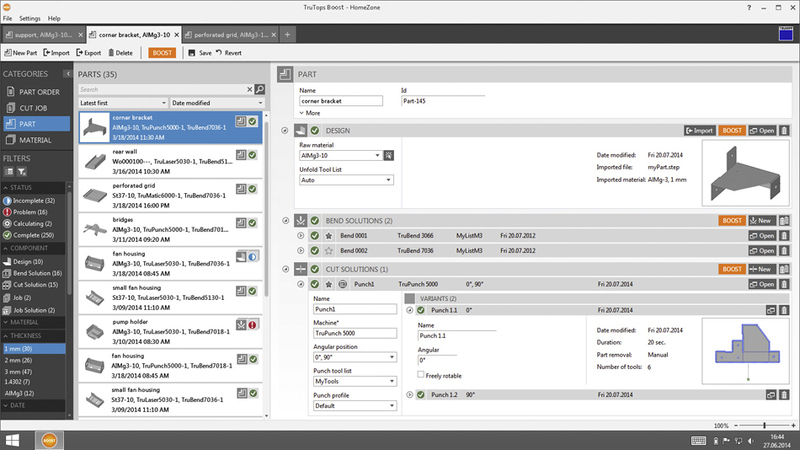 Whether you want to optimize your software infrastructure with individual modules or decide for a complete solution, TruTops Fab is set up to meet your requirements. You profit even with just one machine. Additional machines or functions can be integrated in additional modules without any difficulty. The world of production control awaits you – start off with TruTops Monitor in the area of status monitoring. Later, extend your operations with production control and commercial processing, all the way to stock management. However you want! You only pay for the functions that you really need. With TruTops Monitor, you enter the world of production control or, to put it more precisely, the area of status monitoring. Reduce downtimes with TruTops Monitor. Record and analyze machine data from all workstations in your production area, such as downtimes, error messages, error causes, breaks and maintenance times. If the machine stops or if a fault occurs, the software immediately informs you about the cause. As a result, you have a complete overview of all your machines and, if a fault arises, you can react quickly and find suitable solutions without losing time. TruTops Monitor is the optimal introduction to the world of production control. You can expand TruTops Monitor with the TruTops Fab app, available for all conventional iOS devices. With the app for TruTops Fab, you always have your production in view. The scope is rounded off with machine data evaluation and messages. You are immediately notified if faults occur. This allows you to react quickly and find solutions without losing time. Keep an eye on everything: Keep your entire machine pool in view “Live”. or SMS, round the clock, if faults occur. This lets you react quickly. Reduce downtimes: Connection to the machine control means errors can be quickly corrected. Complete data recording: All machine data can be individually evaluated, according to machine type. Customized evaluations: Data evaluation and visualization can be customized and called up at the press of a button. TruTops Fab app for TruTops Monitor: Keep an eye on your production – anytime and anywhere.